Before we feasted on turkey during the holidays the rich supped on peacock. 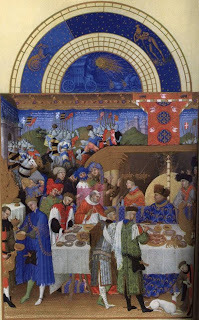 The revelry may have looked like the January banquet depicted in the Très Riches Heures du Duc de Berry. The 15th century book of hours was begun by the Limbourg Brothers and completed by the "Master of Shadows" along with Jean Colombe. 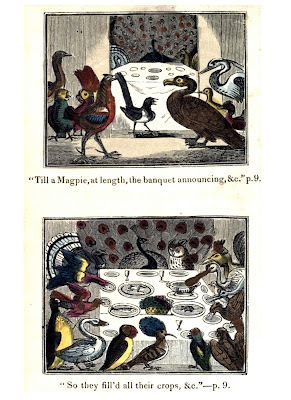 Or imagine if the peacock was the host of a fete as in The Peacock at Home by English poet Catherine Ann Turner Dorset. 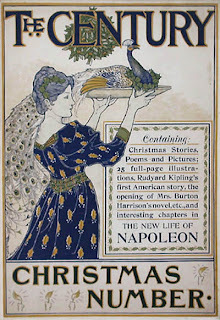 Her 19th century children's poem describes the proud peacock who is not to be out done by The Butterfly's Ball. Inviting his fellow birds to his home they dined on wasps à la sauce piquant and flies en compôte along with worms and frogs en fritur. 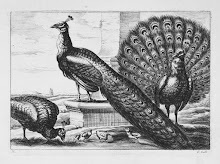 Our humble turkey was once as exotic as the peacock when it first appeared in Europe. In 18th century England farmers walked their flocks to market protecting their feet with little booties before they ended as supper on wealthy patrons' tables.